The Okavango Delta in Botswana is the world’s largest inland delta. It was formed by the emptying of the Okavango River into the Kalahari Desert at the site where an ancient lake once sat. Whilst it may not be an obvious holiday destination for many people, the area is truly fascinating and offers an abundance of activities for travellers who are looking for an out of the ordinary experience. If you are planning a visit to Okavango, the following suggestions will help you to make the most of your time in this unique corner of the globe. For experienced riders, a horse back safari offers a wonderful opportunity to explore the varied terrains of Okavango. The horses will often be walking along with zebra or galloping with local giraffes, meaning that you’ll experience the beautiful Delta pathways and varied wildlife from a whole different viewpoint. Elephant safaris are also popular in Okavango. During these guided tours, visitors will learn about the elephants’ natural behaviour in the wild by watching them interact and play with one another. The safaris are a brilliant experience for animal lovers. 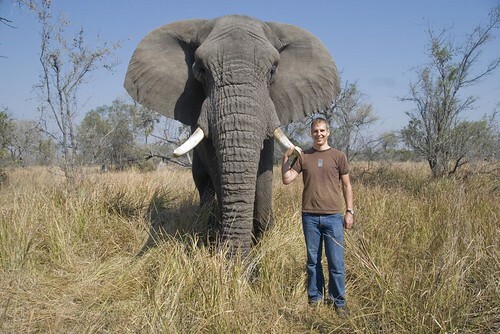 A man with a friendly elephant in the Okavango Delta, Botswana. Mokoro rides are boating trips through the shallow lagoons of the Delta. The boats are traditionally made from trees and are not motorised, so it’s easy to approach wildlife silently. A lot of the boats are now crafted from man-made materials in an effort to preserve the Delta’s landscape, though the experience is still a special one. You’re likely to spot hippos, elephants and crocodiles, to name just a few. Most of the fishing in this region takes place in the Panhandle area, where the Okavango River enters the Delta. Here, visitors can try their hand at catching Tiger Fish and Tilapia. Do make sure that you check with local authorities before fishing in other areas, as some camps operate a no fishing policy. Scenic helicopter flights are widely offered in Okavango and are a great way to see the palm fringed islands and mazes of waterways, which can be hard to fully appreciate from the ground. They also offer an opportunity to marvel at the wildlife for those who may be less keen on getting up-close and personal. Guided walks in the Okavango Delta are led by expert guides who share a wealth of information about local plant life and animals, whilst carefully ensuring the safety of participants. Though you are likely to see lions and elephants, they will not be approached too closely. Walks will usually take place early in the mornings before it becomes too hot to walk comfortably. 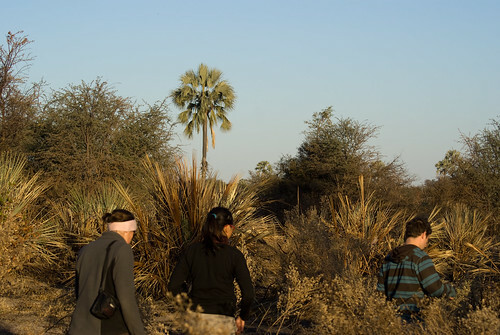 A group of travellers enjoying a guided tour in Okavango. Maun is the closest town to the Okavango Delta. It offers good shopping centres and hotels, though is a far cry from the towns and cities that many of us are used to. It maintains a rural feel and it’s quite possible that you will pass donkeys and goats meandering along the main road. It’s a unique experience and one which should be on any traveller’s itinerary when visiting the Delta. Okavango is a unique destination which provides plenty of options for travellers who like to keep in touch with nature. Image Credits: cloudzilla and Tim Copeland. I just read this one http://www.overlandingafrica.com/blog/planning-a-trip/okavango-delta-safari-guide as well and it’s also very good.